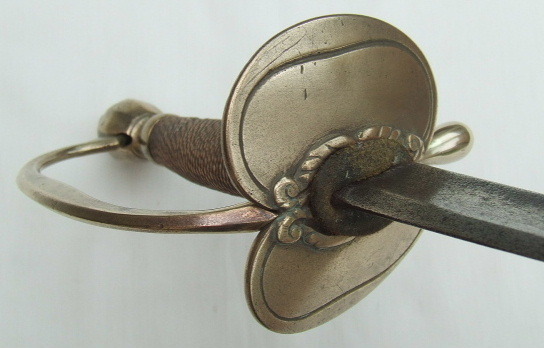 Forum Index > Historical Arms Talk > Show Us Your 18th century swords! And I recall seeing in a catalog about 20 years ago 2 examples with turned wooden grips (in imitation of wire wrapping but no actual wrapping--grips looked original with patina and very good fit to the hilts) given a date of c. 1775-80. Would these have been for non-coms or junior officers, perhaps? These are usually 1796''s that have had the foil removed Tom. 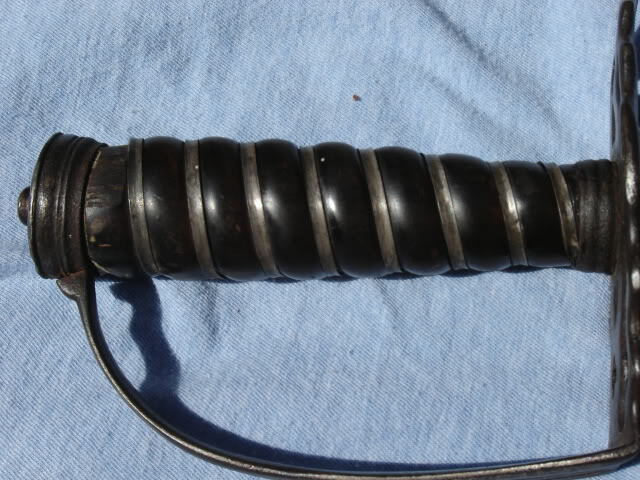 Instead of a wire wrap some grips had a sheath of silver put over the wooden core and then imbossed with a wire pattern, probably in a press of some sort. Over time the wood shrinks and the silver foil loosens, tears and is removed, leaving the embossed pattern on the wood. I have seen early ones with ebony grips cut in a spiral however. 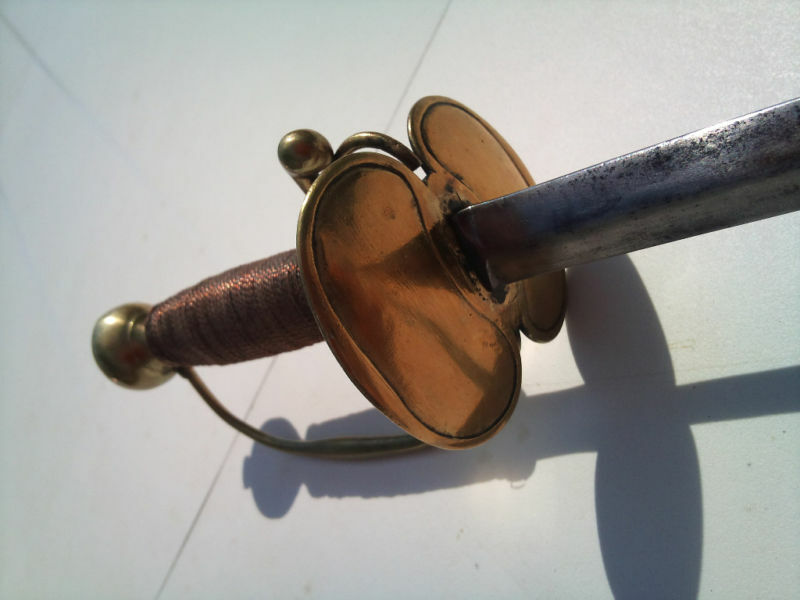 I also agree with you David, Spadroons really do seem like a militarized small-sword for those whose sword fighting technique leaned toward a point-centric fencing style. 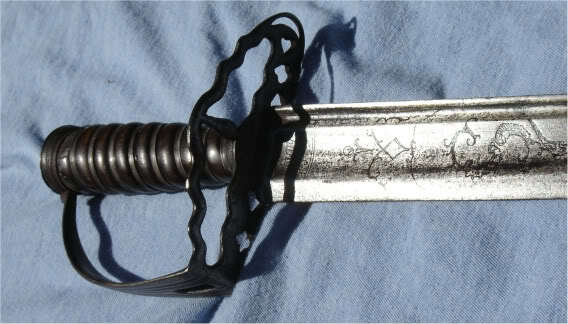 The single edged, rapier-esque blade just gives it a bit more leveradge against any heavier swords it might encounter. Understood. But I think one of those I saw might have been an early one with an ebony grip as you have described--the spiral channels were too deep in my opinion to result from a pressed shell. It was beautiful! BTW: I just ran across what I thought was an English flank or yoemanary (sorry, is that the correct word?) 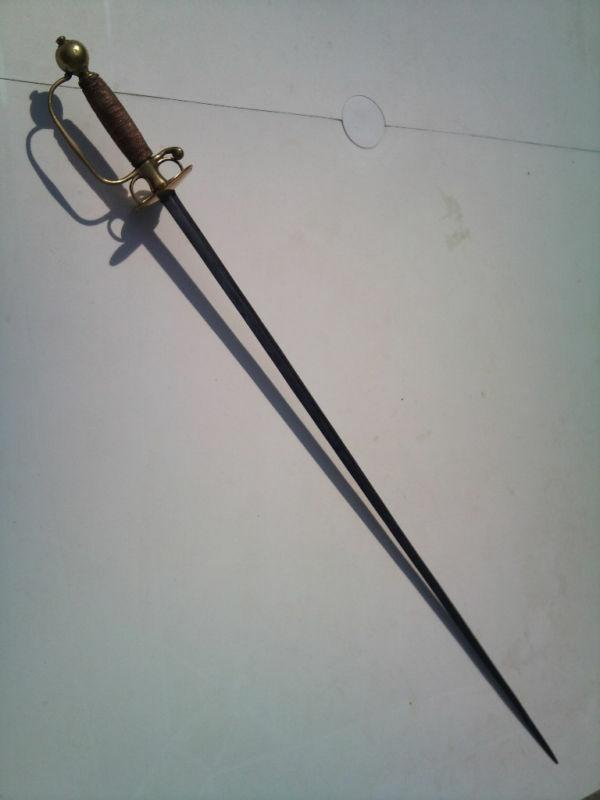 officer's saber, c. 1800-10. A beautiful sword with an exagerated curved blade and bone or ivory grip (does that indicate anything in particular?) in excellent condition. It was at a generalist antique store. I don 't know enough about these English sabers and was not feeling good about making an offer on it. 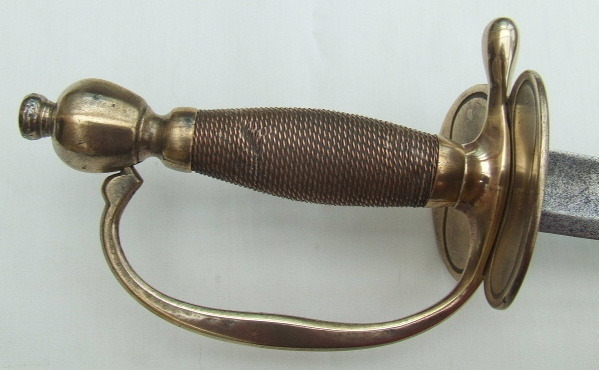 The excessive curve does sound like a flank officer/light infantry officer sword. How long is the blade? I did not get measurments on that saber. That is a nice short saber (that's what I call them--I think I picked it up from Neumann's book.) I really do find the short sabers of the American Revolutionary period fascinating. I do think a robust cuttoe would be servicable as with these short sabers. I think Neumann features a couple short sabers that were even shortened more professionally--apparently the officers were wanting something with a blade around 23 inches. One has a clipped point, so it might be a case of just bringing it up to date with the latest fashion. If we only knew! I think your new found love of hunting swords and cuttoes has opened you up to a whole new range of swords! The sword at the antique shop sounds interesting. What it be immoral to get a cell-phone pic of it? Perhaps you are correct. But the small-sword will always be my "first love." I think an affection/appreciation for more than one type of sword is superior. After all, its MORE SWORDS! Here is a nice french officers soldat. sigh.. Very nice. I am being very disciplined and not puchasing anything right now, even though I wassorely tempted. It went for a great price too. Ah well, we can view it here. The elongated rectangular knuckle guard makes me think it is early first half of the 18th cen. 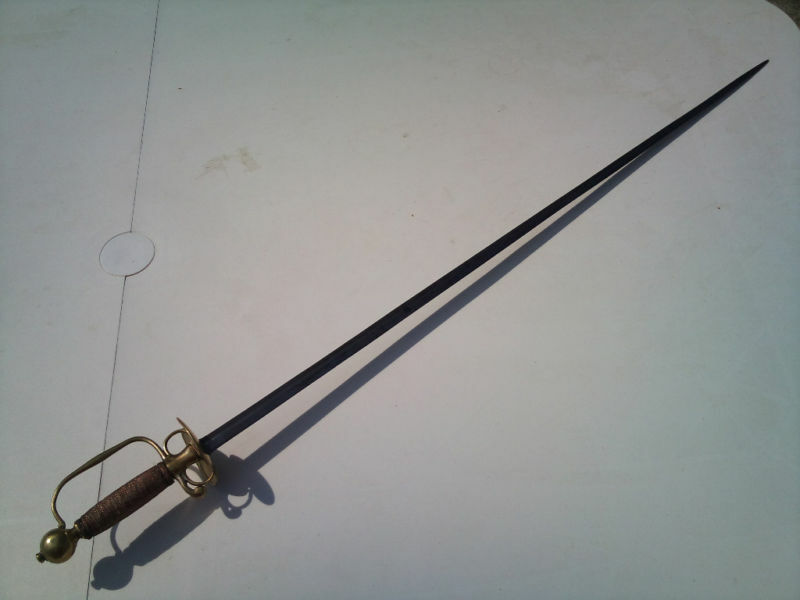 A Chinese sword (single-edged, thus a "dao"). This sword was discussed earlier in this thread. Dated as 18th century by Harvey Withers. It's short, it's light, and if new, it would slice with ease. Very nice! It reminds me of a falchion in a way. 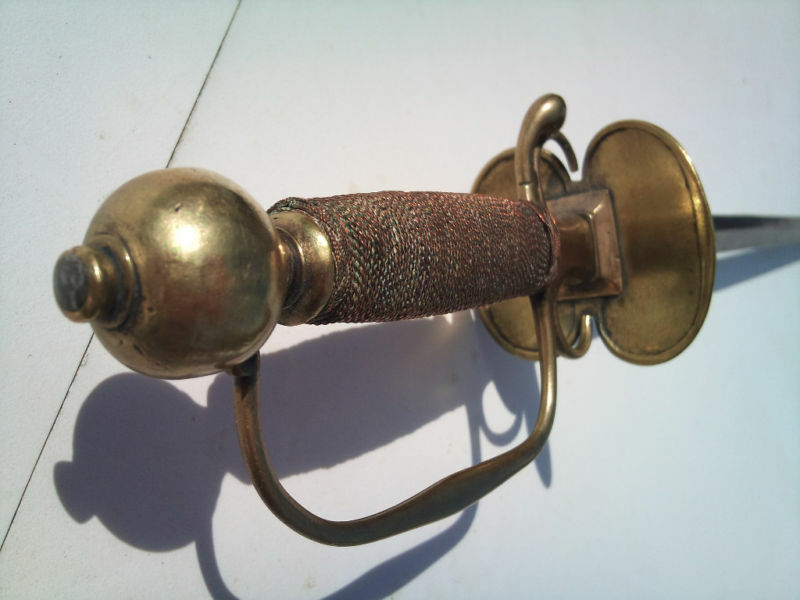 Harvey Withers described it as "An early 1700's Chinese Falchion sword", so it isn't just you. And it is pretty much a Chinese falchion. Impressive format and catologue, Mr. Critchley! A very nice web page display! Would you say something about that basket hilted sword--it's quite a looker--I'm not a basket hilt type of guy, but this one appeals to me. Oops! I see you have an additional page there with lots of information--sorry I missed it initially. I am glad to see that you included your small-sword. Posted: Wed 11 May, 2011 12:18 am Post subject: "C.D. Wolfe New York"
I am not sure that this is War of 1812 period--seems as if the etching would place it after that period. 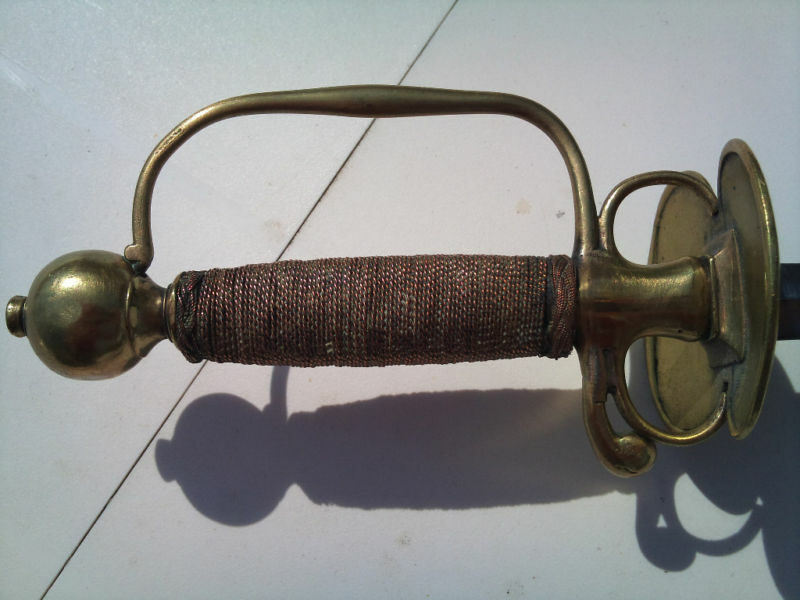 There is a tendency to attribute stirrup-hilted sabers to the War of 1812 period, but this style of sword was in service into the Mexican and Civil War periods. Whatever the actual period, it looks lke a nice saber.